Elegant, evocative travel on land, sea and air both past and present. The world in all it's serene, sultry wonder. THE ELEGANT, EXCEPTIONAL ROUTE TO QUALITY TRAVEL…. The 24,000 ton Celestyal Crystal has sustained bow damage after a collision with the tanker, Ste Pimlico, over the weekend. On board at the time were some 852 passengers and 382 crew. All are reported to be OK, as are the men on board the tanker. A photograph reveals a deep, wedge shaped gash in the prow of the Crystal- once very well known as Norwegian Cruise Lines’ popular MS Leeward. The collision happened while the ship was embarked on one of her popular, seven night cruises from Piraeus to the Greek Isles and Turkey. According to owners, Celestyal Cuises, the damage must be repaired before the ship can continue with its scheduled cruise season. This includes a third, upcoming winter charter to Cuba Cruises to operate the popular round Cuba cruises sold mainly to Canadian passengers. Celestyal has been very proactive in coming forward with a number of alternative arrangements for those passengers on board at the time. These include; A free, two day hotel stay in Istanbul, free shore excursions, the option of a transfer home, or the possibility of transferring to another ship in the fleet. 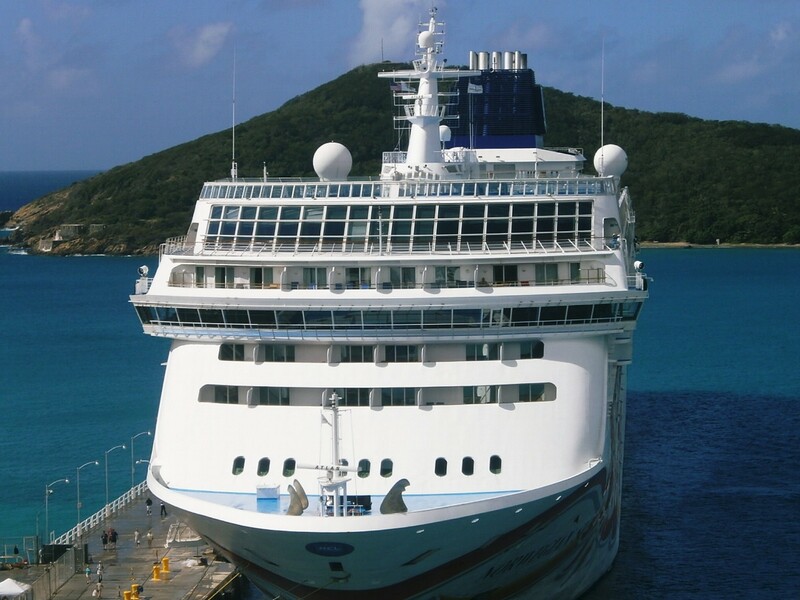 In addition, all passengers will receive a full refund on their fare, plus a complimentary, free seven day cruise. This must be taken by December, 2016. 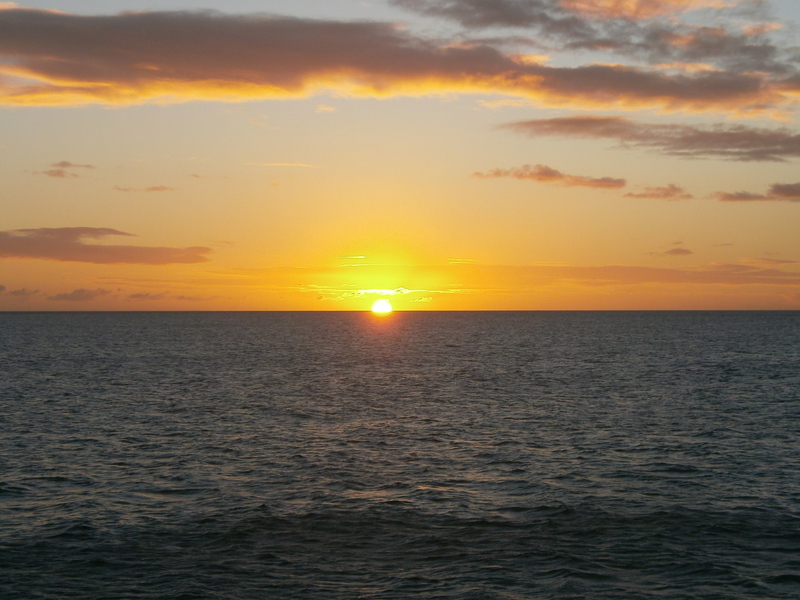 HAWAII- A CRUISE TO SUIT YOU? For a great many people, a cruise around the beautiful series of islands that collectively constitute Hawaii seems like the stuff of dreams. And why not? Majestic mountain, scenery, stunning Pacific sunsets and, of course, that all pervasive spirit of aloha makes these islands among the most compelling holiday destinations anywhere on earth. Of course, few would dispute that a cruise is the easiest, most cost effective way to see this mid ocean string of pearls. The ease, relative economy and sheer convenience of a floating hotel is impossible to deny. And, if it were just about boarding a ship and going there, then I suspect that many, many more of us would do it in a heartbeat. However, from the UK and mainland Europe, even getting to the embarkation port is quite a stretch. Most ships sail from the port of Los Angeles, which means a minimum twelve hours’ flight from the UK alone. Of course, if time (and money) are no object, you can add in a few days in California proper both before and after your cruise. But, any way you slice it, getting there is a long slog indeed. But let’s assume that you have done just that. Now you’ve got four full days to relax at sea, en route to Paradise. Then, like one frantic, hectic merry go round, those beautiful islands come and go, one after another, vying for your attention over the course of four full days, before another four day sail back to the west coast. Wow, that was fun. is everyone OK back there? Typically, these cruises sail in April and October, and most spend no overnights in Honolulu, which for me would be an absolute deal breaker, I’m afraid. Waikiki Beach, Diamond Head, and of course, the poignant memorials at Pearl Harbour cannot be truly absorbed in eight hours. I would always want at least an overnight stay in Honolulu. There is one alternative; you can fly straight to Honolulu itself, five hours’ west of LA, and board the Pride Of America for a week long circuit of the islands. With a couple of overnight stops en route, this is easily the most ‘up close and personal’ way to cruise the Hawaiian Islands. It really does allow you to get under the skin of the main sites. And, of course, you could fly in a few days early, and really enjoy some quality personal time in Honolulu prior to setting sail. The downside is the minimum of around twenty hours’ flying time to achieve Honolulu. And, while the cruise experience is sublime, it is also very expensive. For single travellers, cruise only in a studio cabin (and there really are only a handful compared to the rest of the ships in the Norwegian fleet) is typically double that of a week in a similar cabin to, say, the Caribbean, or even famously pricey Bermuda. A typical, nine night fly cruise package from the UK in a studio cabin will lighten your bank balance by a full three thousand pounds. And, if you want a few extra days beforehand in Honolulu, then the fund factor goes upwards by quite a way. So, there you have the pros and cons of cruising to and from Hawaii. None of the options available are perfect; largely a consequence of the remote geographical locations of the islands themselves, if truth be told. But, that said, I venture to say that any cruise out to or, indeed, around those islands, will yield a priceless return on your investment of time, cash and sheer stamina. It’s axiomatic that the places most worth achieving on this earth are the ones that are often the hardest to reach. And, if the Hawaiian islands were easy to reach, they would long since have lost much of their patina of wonder and mystery. For anyone that disagrees, I have one word as an answer; Nassau. Originally one of the most exclusive and sought after resorts on the planet, the capital of the once hugely top drawer Bahamas has become a byword for tacky, over rated and over priced hype; any pretensions to real style went south- quite literally- many decades ago. The relative remoteness of the Hawaiian islands acts as a force field against that kind of creeping degradation, but the flip side of that same coin is high prices and an island group that is hard to reach comfortably. But there is no other way around it. So, should you still go? Absolutely. If the urge to go is too much to resist, then you cannot put a true price on going. And, in my book, the price tag attached to a missed opportunity, regretted over the course of a lifetime, is incalculable. On the face of it, winter is the ideal season for scores of sun deprived, pale faced Europeans to flee to the far warmer, more welcoming waters of the Caribbean. And flee we do. Like hordes of migrating bluebirds, we follow the sun and pour up the gangways of the megaships, sailing from Miami, Fort Lauderdale and Port Canaveral to those sun splashed little island idylls. Snow, slush and bone chilling cold is no competition for the subtle, seductive lure of broad, bone white beaches, idly waving palms, and the indolent ‘no worries’ lifestlye that has always made the Caribbean so damned compelling in winter. On the face of it, it’s a no brainer. Of course, the same holds broadly true for our American and Canadian friends, especially those bunkered down in that bitter winter bruiser known as the north east corridor. From Toronto down to Washington, DC, plane load after plane load of weary winter refugees sag gratefully into the open arms of benign Florida sunshine. The world and it’s wife can take care of itself for a week. It’s full speed ahead, destination sunshine. And, while all of this is fine and dandy, it very much depends what you want from your Caribbean experience. If all you want is just a fun filled week in the sun, then fine. But, if you really want to get ‘under the skin’ of those self same islands, there are some other things you should know about the Caribbean winter cruise circuit. Any way you slice it, the winter Caribbean cruise circuit is very, very, crowded. Scores of ships that spend summers in Europe and Alaska flee like migrating birds of passage to the warmer, more welcoming Caribbean sun each fall, and stay there till the following spring. This can mean some fantastic bargains in terms of fares, but trust me, there will be very little that is peaceful and quiet about those islands. Traffic is intense, and almost all of the main shopping streets are a glut of gold, tanzanite and diamond shops. Roads are busier, taxis more in demand. It takes longer to get anywhere and, inevitably, everywhere is much, much, more crowded. Little surprise, then, that tempers can sometimes run just as hot as the temperatures. To give one example; back in December 2003, I saw no less than fifteen cruise ships stocked up at Cozumel, Mexico. Every pier was full. Some of the most famous and prestigious cruise ships in the world were obliged to anchor offshore, tendering their passengers in. By the time you factored in the off duty crews coming ashore from all of these ships, the result was a vast human tidal wave, well in excess of thirty thousand strong. That was 2003. The count of new cruise ships coming on line since then is mind boggling. And more are coming. Virgin Cruises wil debut a trio of enormous new cruise ships in a few years, each one bound for the winter Caribbean. MSC Cruises will also offer year round Caribbean cruises, with their enormous new Seaside-class vessels, too. Newbuilds from Royal Caribbean, Carnival and Norwegian Cruise Line will further add to the mix. Rather than getting calmer and more sedate, the Caribbean is going to get busier and louder. And there is no changing that. Many repeat Caribbean passengers are, quite frankly, getting bored with the same old islands. Warm and inviting as they are, the likes of St. Maarten, St. Thomas and Grand Cayman have become something of a well worn ‘greatest hits’ collection of Caribbean hot spots. So the cry goes up; what’s new? We want new! And ‘new’ is what passengers will get. Well, kind of. Brand new cruise line developments such as Amber Cove and Harvest Caye, purpose built from scratch, provide the kind of safe, secure Caribbean experience that might well entice the old hands back, as well as wowing the newbies. How much connection these wonderful, almost Disney-esque places have to the actual, day to day experience of Caribbean living is another thing. But then, you’re not going to live there, are you? Those points made, there are ways in which your winter Caribbean fun run can be kicked up by several notches. Here’s just a few points that you may find worthy of your august consideration. That’s right. Give Florida’s fun fuelled embarkation ports a complete swerve, and board a ship in, say, Barbados, or even Puerto Rico. Though you’ll still get the crowds, you are far closer to many of the islands themselves. 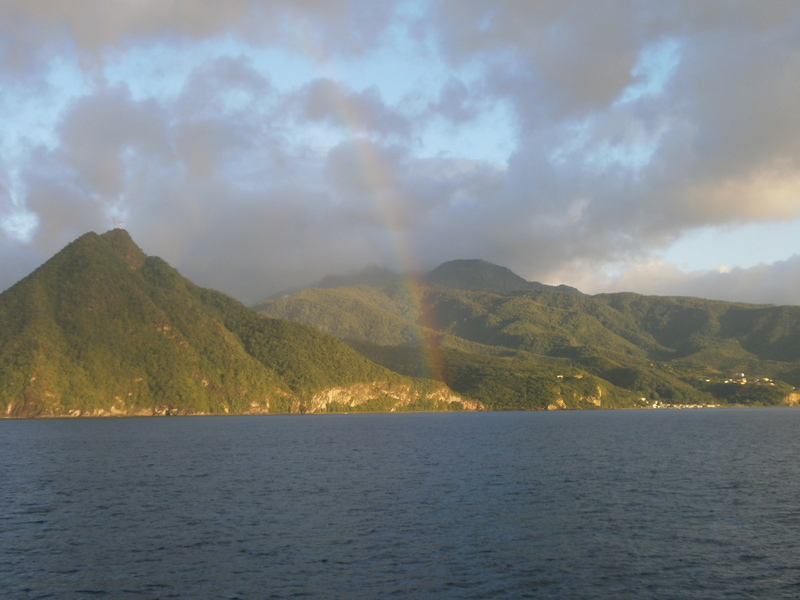 On a typical, seven night cruise, you’ll hit at least six different island calls. Frantic yes, but you’ve got more chance of a richer, deeper experience. For many, this could be a deal breaker. Forget those fun filled floating theme parks, and go for a voyage on the smallest, most exclusive ship that you can afford. The smaller they are, the more inclusive they seem to be. The likes of Silversea, Star Clippers, Regent, Seadream, Seabourn and Crystal will all offer you salubrious, sybaritic indulgence on such a scale that the experience of cruising the Caribbean is massively elevated. These smaller ships can raise the bar- and the price- by quite a way, but the experience is truly unforgettable. They can also often access the smaller, far more intimate islands, such as Jost Van Dyke and St. Barts, that the big ships have to bypass. Thus, your Caribbean experience becomes far more intimate, pared down and personal. In short; you get what you pay for. But– even the most exclusive of ships will sometimes deliver you into the same massive crowds at the ‘greatest hits’ ports. Your six star, boutique ship may well look swanky and impressive when docked next to the latest floating death star at sea, but you will still be competing with its passenger load for access to taxis, beach space, and shopping and restroom facilities. Which is precisely why these de luxe ships try and avoid the busiest of these ports in peak season; sometimes successfully, sometimes less so. It’s horses for courses. All of that said, none of the points up above should prevent you from running like a March hare to any of those islands in the sun during the winter. Maybe, like me, you are quite happy to relax on board quite a bit, and then just saunter off to a favourite, nearby beach for a few hours once the crowds have headed off for their day of pirating ashore. And, crowded or not, few things sooth the soul quite like a hammock on some sunny beach, with a feisty, frost crusted strawberry daiquri to hand, with warm sun, cool breezes, and the sound of reggae kissing your ears. It worked for me back in the Eighties, and it still works now. Maybe I’m just weak and predictable, mind you. The bottom line is that the Caribbean has it’s complications and flaws in winter, and some will find them maddening to the point of temporary distraction. But hey- a distracted day in paradise, noise, crowds and all, is still a giant leap for mankind better than a day driving through a blizzard to reach the factory or office. On balance, get out there. Just be aware of the potential pitfalls, and choose accordingly. And yes, I’m afraid that hammock is taken. Have a nice day. A winter wonderland; it’s called the Caribbean…. Sailing day; it still leaves me with that ‘kid-on-Christmas-Day’ feeling…. Add in the fact that I’m sailing on one of my favourite ships-the magnificent Marco Polo, celebrating her 50th anniversary this year-and you’ll perhaps understand why my adrenaline was running like tap water as we pulled up at the North Shields passenger terminal. Originally designed to service the overnight ferries sailing to and from Amsterdam, the terminal- used for Newcastle/Port Of Tyne sailings- doubles up for cruise use on seasonal summer sailings from the Tyne. And, for someone used to making the long treks down to Southampton, Dover and Harwich to board a ship, the sheer ease and convenience of being able to rock up at my local home port never fails to amaze me. Check in was arranged deck by deck and, though the ship had sold out (Capacity 800, adults only), the boarding process took exactly twenty five minutes. That’s from entering the terminal to walking into the warm, Balinese themed lobby of the Marco Polo. Pretty damned good, that. Though she is as pretty as a postcard, the Marco Polo remains refreshingly intimate. More comfortable than luxurious, the feeling of boarding her is akin to sagging gratefully into a pair of favourite, comfortable slippers. There’s a feeling of gentle, contented ease that comes from being cocooned in something that is at once instantly welcoming, and yet wonderfully familiar. On both counts, the Marco Polo hits the bullseye. A thorough but relatively short lifeboat drill follows, by which time my luggage is already outside my room. I have time enough to check out the daily programme, before being pathetically overcome by the need for that first, invariable ‘bon voyage’ drink. Almost inevitably, I take this on the gorgeous, curved terrace that frames the outside of Scott’s Bar, overlooking the stern. 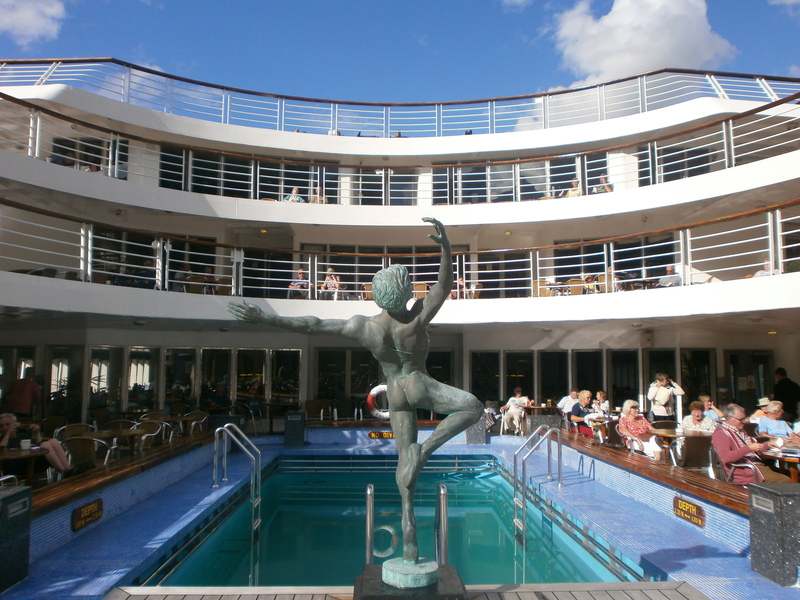 Sat back on cafe chair, feet braced against the deck railings- the classic Marco Polo cruising stance- I tip my vodka and cranberry briefly in the direction of ‘Rudy’, the statue of Rudolf Nureyev that forms a focal point on the aft lido deck. Rudy and I have become well acquainted over the course of three decades. This contented little reverie is gently shaken by a muted trembling that passes through the deck rails; one that always sends a shiver of delight running up my spine. I glance to port and, to my sheer, infantile joy, the Port Of Tyne terminal is already falling away like a fading souffle. The gangway is gone, as are the ropes. Those last, little tenuous links with reality are no longer needed. 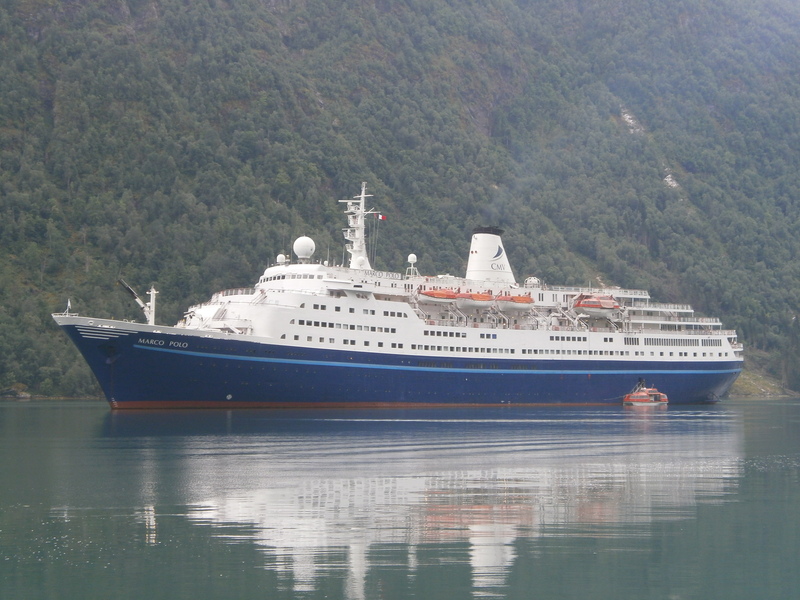 Poised and perfect as a swan, the Marco Polo gives a first, tentative surge forward. Her whistle roars out a stately triple salute to the Tyne as a squadron of gluttonous, over fed gulls shriek, scream and swoop in her wake like so many demented dive bombers. People on house balconies lining the stately, steel grey river look over and wave as this fantastic floating time machine surges majestically past them, almost close enough to touch. Another vodka and cranberry appears at my elbow. I can’t help but smile. Now out, past Tyneside’s historic breakwater, following in the wakes of the Mauretania, the QE2, and many other famous legends of yesteryear. Out of the Tyne, on a ship still writing chapters in her own, imperishable legend. One we are sharing, even as we savour it. The North Sea welcomes us with benign skies, and sparkling sunlight dancing on languid, lapping waves that seem to speed the lady on her way. A stately, gentle roll begins to assert itself; the immutable overture to our voyage up ahead. Feet back up on the railings, I sit staring at the clouds, drifting by in the sky like fleets of ghostly galleons. A sense of freedom dances in the ether around me. It clinks the ice cubes together in my glass as if in celebration. At least, that’s how it seems right at that moment. And so, we are off. It begins again…. For the first time in several years, Regent Seven Seas is offering guests the option of booking a full world cruise in 2017. 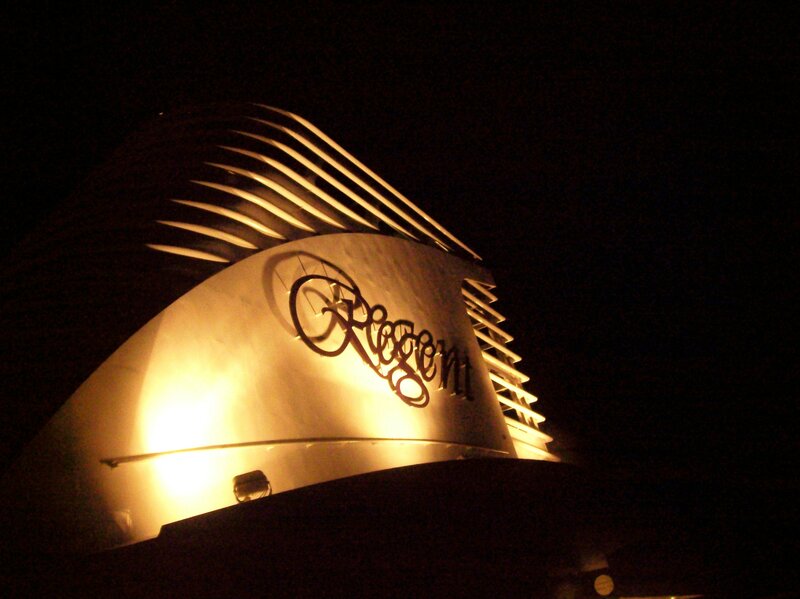 In a somewhat surprising move, this will be offered aboard the 1999 built, 490 guest Seven Seas Navigator. Normally consigned to a season of luxurious Caribbean cruises throughout the winter, this will actually be the first time that the six star ship has made a full circumnavigation of the globe. However, the smaller size of the 28,000 ton ship will allow her access to more intinate, off the beaten track ports of call, as well as the ‘greatest hits’ ports of call that fill out most potential world cruisers’ bucket list. And her entry level balcony suites are also slightly larger than those aboard her slightly larger sister ship, Seven Seas Mariner. Though the itinerary has yet to be announced, there is no doubt that the Seven Seas Navigator is an inspired choice for a world cruise. In particular, she offers a handful of window suites, sans balcony, that might appeal more to some potential voyagers. The entire voyage goes on sale as of July 15th, so I anticipate that the actual route will be unveiled just prior to that. Normally based in Florida over the winter season, it does seem a safe bet that the entire adventure will both start and finish in either Fort Lauderdale or, more likely, Miami. Almost certainly, the entire affair will be offered over a number of sectors as well. And, as Regent is an all inclusive product which includes free shore excursions at every port of call, the sheer inclusiveness of this itinerary is going to be pretty hard to beat. Interesting and intriguing by turns, this one. I expect this one to sell pretty quickly once it does actually go on sale. 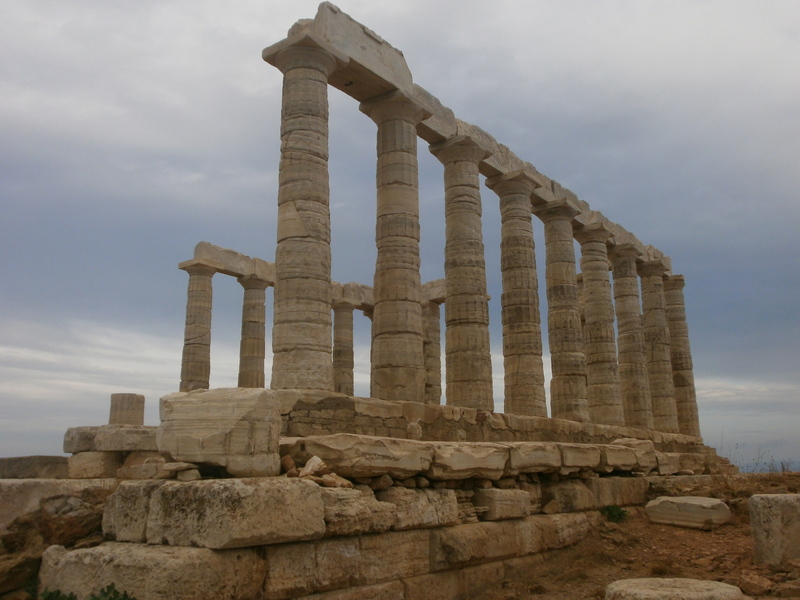 YEAR ROUND CRUISING FROM ATHENS- COMING SOON? It has been increasingly bruited over several weeks that the port of Athens might be gearing up to become a year round departure port for cruises. With these stories gathering pace, I thought it might be worth a look at the possibilities. 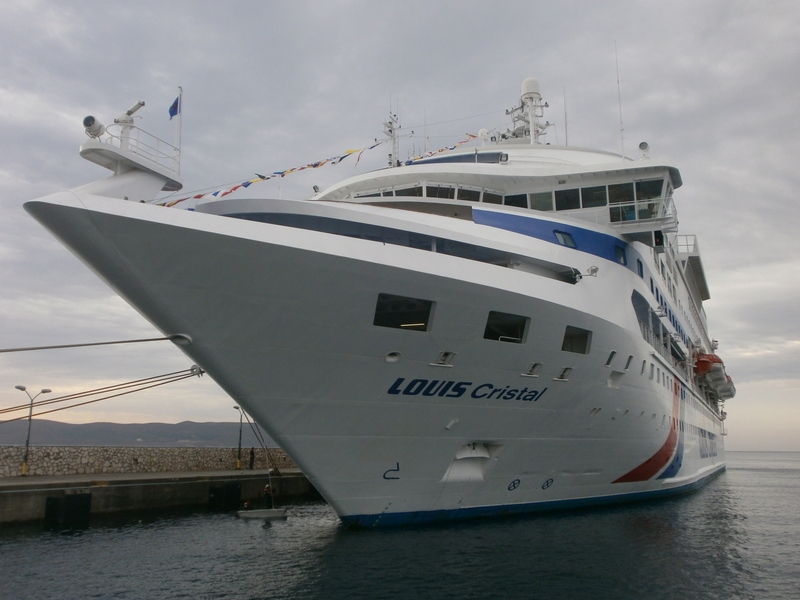 The obvious major contender for this would be Celestyal Cruises, part of the Louis Group. Although their Cristal goes out on charter to Cuba each winter, the company’s biggest ship- the 38,000 ton Celestyal Olympia- is usually laid up in Piraeus from November through to April each year. That makes for five totally unproductive months when the vessel is doing nothing but racking up port fees while earning no revenue. So, any opportunity to bring in money- especially in the current Greek situation- ought to be a no brainer. On the other hand, that winter Aegean weather can be famously unsettled. Many of the Greek Islands are tender ports, and any winter storm might well mean foregoing a port of call. Also, the temperatures are going to be a good way cooler than in the high days of summer. These have always been the main reasons why the domestic Greek cruise scene- that is, Celestyal itineraries- typically begin each March, and then end each November. But the truth is that, even if some tender ports have to be abandoned because of bad weather, there are quite a number of ports with open berths in winter- I’m thinking of the likes of Kusadasi and Marmaris- which are likely to be available as viable substitutes. Even in summer, the weather can sometimes oblige cruise ship captains to abandon planned port calls, hopefully arranging some nearby substitute. There is nothing new- or unusual- in this. make most firms think twice about that, at least for the foreseeable future. And- for those who do not think that year round Greek Island cruising is feasible, I’d just remind you that the same was said of the Baltic, when P&O pioneered the first ever winter Baltic Capitals cruise some years ago. These have been quite successful; enough, indeed, for many rival lines to also start offering them. Also, consider how popular cruises to the often stormy waters of Northern Lights itineraries have now become. Passengers now no longer think that cold weather and rough seas would be an impediment to such an adventure. And it goes without saying that, even in the depths of winter, the Aegean would be a lot calmer and more benign than either of those options. Short winter cruises in the Aegean? Hell, why not? A potentially fascinating development, methinks. As ever, pray stay tuned. Slowly, like a patient coming out of a long term coma, the market for cruises to the Mexican Riviera is beginning to revive. And, in the opinion of many, that’s not before time. As winter sun destinations go, the seven day ‘Riviera Runs’ that sail round trip from Los Angeles are a pretty compelling alternative to the overcrowded winter hugger mugger of the Caribbean, though the latter certainly has better guaranteed weather. Mazatlan, Puerto Vallarta and Cabo San Lucas form a pretty compelling troika of ‘greatest hits’ ports of call, ranged against the smoky blue sprawl of the Sierra Madre mountains, that offer a very different experience to their vibrant Caribbean counterparts. Yes, the beaches are wonderful, and the Margaritas are fantastic, frosty confections found almost everywhere. But the pace is less frenetic- a consequence of it being much, much, less crowded. And, of course, the truly star struck have the pre- cruise option of venturing out on star spotting safaris in La-La Land. Pretty good, eh? But for something a bit more, well, inclusive, I’m really taken by some of the Mexican Riviera cruise being run by Norwegian Cruise Line this fall. They combine departures from my favourite California city- San Diego- with eleven nights’ aboard my favourite ship in the Norwegian fleet- the always excellent, hugely under rated Norwegian Sun. The company never promotes this wonderful ship to anything like the same degree as her newer siblings, but she has always been something of a trailblazer. And that reputation is freshly enhanced with these new cruises that really do give you more of Mexico than simply the banner ports of call. For many years, Acapulco was the gem of the Riviera. In the so called ‘Swinging Sixties’ it was perceived as one of the most glamorous resort cities in the world. Time and tide chipped away at that carefully applied make up, and the city became almost a no go zone by the late nineties. Now, freshly powdered, tidied up and inherently more appealing than it has been in many a long decade, Acapulco is back on the menu- at least for the Norwegian Sun and her passengers. I suspect this might be the first of many returning vessels over the next few years, as Pacific Mexico begins to aggressively assert itself to the cruise industry once more. Also on the menu is a call at the beach resort of Ixtapa, and a full, two day call at fun filled, bohemian Cabo San Lucas, a place that feels in parts like a Pacific version of Key West. Also on the menu are both Mazatlan and Puerto Vallarta, those other two members of the ‘Holy Trinity’ of Mexican coastal ports. Combined with an option to spend a few days getting reacquainted with cool, classy San Diego, these longer, more in depth cruises on the always excellent Norwegian Sun could well be the perfect cure for your looming winter blues. I know fine well that they may very well be the cure for mine. Anyone else in? Sharp as a butter knife, the slender, raked prow of the Marco Polo cut an elegant swathe through the grey, rolling swells of the summertime Baltic. To port, the last, lingering remnants of the setting sun cast a surreal, golden slant across the top of the thin membrane that separated sky and sea. Inside, soft light glowed on beautiful marble and etched glass, bathing the entire ship in a warm, cosy glow. From somewhere up forward, the sound of a moody, throaty saxophone caught my ears for a moment. We were less than two hundred miles from Saint Petersburg, and a million more from reality. Celebrating her incredible, fiftieth anniversary in 2015, the Marco Polo- a ship that first set sail in the same year as the first keel plates of the QE2 were laid on Clydebank- was returning to the waters that had actually given birth to her. With a sell out capacity of just under eight hundred passengers, the adults only, awesomely anachronistic ship provided the perfect platform for the adventure of a lifetime. And what an adventure it proved to be. A string of stunning sea cities throng the edges of this ancient, alluring sea like so many gems, danging from an ornate necklace. Taut, compelling Tallinn, that amazing medieval theme park; cool, classy Stockholm and bustling, beautiful Helsinki. Warnemunde, the gorgeous, stunningly vibrant German beach resort used as a jumping off point for Berlin…. As for Copenhagen, even Danny Kaye underestimated how ‘wonderful’ Copenhagen truly is. Day or night, this rollicking, largely pedestrian city is the fun capital of Scandinavia; a compact city of green copper spires, long, winding streets and vast, open squares. Canals full of fishing boats and one of the world’s most amazing theme parks are suffused by the warmest and most welcoming vibe anywhere in the region in this shimmering, ethereal summertime playground. Saint Petersburg is, of course, different. More remote, a city with so many different facets. One part Faberge egg, one part Russian matroshka doll, this fabulous, turbulent city merited the two days we spent there, and would have merited many more as well. Grand, imposing and full of almost relentlessly European architecture, the great city wears the scars of it’s turbulent, three hundred year plus past like a series of battle honors. Revolution and suppression; war and famine. siege and a seat of government; Saint Petersburg has seen it all. A city where Tsars, assassins and men like Rasuptin, Trotsky and Lenin once strolled, plotted, and set into motion the events that defined an entire new world order. As destinations go, it has compulsion and attraction on a scale perhaps unmatched anywhere else in the world. Over the next few weeks, we’ll visit all of these amazing places in more depth. And, even more importantly, we’ll get under the skin of the relatively small, massively alluring ship that carried us to and from this amazing series of fairground rides. Make no mistake; the Marco Polo is truly unique. And she gets more so as the years pass, because nothing like her will ever be built again. Part time capsule, part antidote to the fleets of mega ships breaking out across the world’s oceans like some vast, incurable rash, the Marco Polo is a voyage of discovery all by herself. So, I’d like to cordially invite you on board. May I recommend that you check out the expansive, aft facing outdoor terrace of Scott’s Bar, and perhaps treat yourself to a cold Vodka and Cranberry? Grab a seat, kick off your shoes, and just breathe. We have three thousand or so miles to go. The ropes are off, and a slowly widening gap is opening between the quayside and that gorgeous, flaring blue flank. Let’s see what’s out there, eh? THE MARINA; GETTING THERE, AND GETTING ON…. SS UNITED STATES; CRYSTAL SALVATION?